Christian Yang and Ian Wright: TV's new odd couple? Worldwide icon-chevron-right Asia icon-chevron-right Hong Kong icon-chevron-right Christian Yang and Ian Wright: TV's new odd couple? Hong Kong is a city full of taste. Whether it’s clothing, cinema, music or art the fragrant harbour has carved a place in the international arena in all such disciplines. But when it comes to food, it’s hard to find another city anywhere on Earth that has the scope, variety or passion to match Hong Kong. And it seems like the producers at lifestyle cable network TLC think so too. 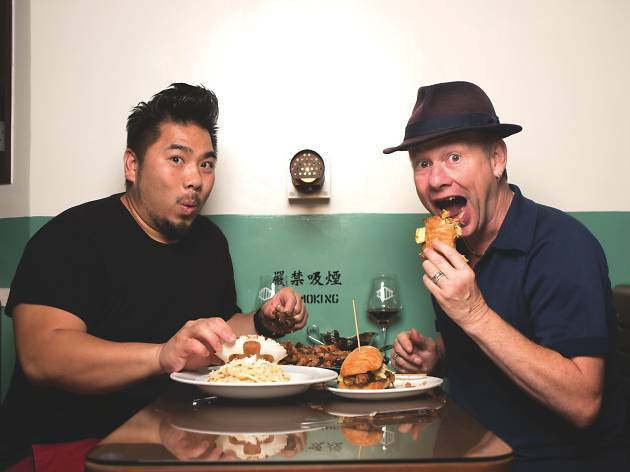 In partnership with the Hong Kong Tourism Board, the three-part TV series Taste of Hong Kong is to be broadcast to 133 million viewers and explores the food scene in our city with the help of two hosts that hit it off with an incredible energy. The face of many travel shows, Ian Wright has hosted the likes Globe Trekker and Invite Mr Wright. An accomplished actor and artist, Wright brings with him an outsider’s fresh perspective when it comes to our dining scene. Co-hosting with him is celebrity chef Christian Yang. Born and bred in Hong Kong, the former restaurateur has been busy with everything from conducting cooking shows on Now TV to playing the part of a lovable chef on Viu TV’s latest sitcom, AM-PM. 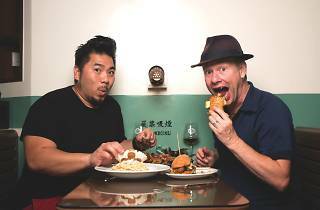 For the show, the pair trek around town discovering Michelin-starred restaurants, street food and contemporary cuisine. How are you finding Hong Kong this time round, Ian? IW: A rediscovery. Actually, more of a first time discovery because the times that I’ve been to Hong Kong before, I didn’t get to go to the sorts of grassrootsy places like I have with this show. So this is like my first real experience of Hong Kong and I love it. Christian, what aspects of Hong Kong did you want to show Ian? CY: Hong Kong is pretty well known for its food and we have come a long way since the days of bird cafés and dim sum. We’ve a lot of young chefs who are taking things to a new level. The most exciting thing is that we’ve used what would be considered traditional Hong Kong cuisine as an inspiration to create new dishes that’re more modern. That’s what I want to highlight. And on this journey with Ian I’ve been able to look back and say, wow, we really do have a lot more than dim sum in Hong Kong. You guys have been spending a lot of time together. How would you describe this relationship? CY: The papers will be signed by tomorrow. IW: It was like a marriage in two weeks. We went through the sort of flirting stage on the first day and we got married on the second day. Then we had quite a honeymoon the rest of the first week and then the long silences came. Then things got a bit bitchy but now we’re friends again. Then we divorced and now we are learning to be friends again, all in the space of two weeks. Is there anything you can’t stand about each other? IW: Join the military and get a proper haircut! CY: Man, your pants are going to take on a life of their own and walk off by themselves. IW: Let me explain. When you’re filming, it might not be in the order the show gets put together – it gets edited and put together like a jigsaw puzzle. So to make things easy on everybody you wear the same outfit. CY: I’ve got 80 of the same shirt and pants, and whatever I wear gets washed every day. Ask this guy when was the last time his pants got washed. Moving on… what’s the most memorable thing you ate, Ian? IW: The ribs in The Chairman [in Central] are absolutely off the scale. CY: You loved those and you asked for more. IW: That ginger thing really knocked my socks off. You know, in the bowl, one of those old traditional ones, ginger sauce with the balls. The sesame balls. CY: Oh, tong yuen [sweet dumplings]. IW: First I tasted the intense ginger but then the ball was bouncy, like – bom bom bom – a rubber ball. Then it went inside out and all this sesame came bursting through. It’s so nice. If you had more time, what other places would you guys like to explore? CY: I don’t know. You can never have enough time to go around and take people to enough places. There are still some more noodle shops that I wanted to have Ian try. It’s noodles that I think this guy would appreciate. But we had a really good concise list of what we needed to do and I think we’ve done Hong Kong justice. Lastly, Ian. You’re known for your impressionable personality and your ability to mingle with any culture you visit. Do you have any tricks and tips for other travellers? IW: Everyone loves a fart joke. It doesn’t even matter if you don’t even speak the same language. There’s a glint in people’s eyes when they know you’re a cheeky monkey and they laugh or, at least, chuckle. It’s a huge ice breaker. Taste of Hong Kong starts on Now TV TLC (ch213) on September 30. The program will be available on Discovery on Demand in October.